A week ago I enjoyed the opportunity to attend a field trial event held in Utah by the National Vizsla Association (NVA). Since this was a formal, judged event there were not many opportunities for photography, but it was a great experience to see some extremely well-trained pointers in action. While there I was speaking with a trainer who was interested in capturing better images of dogs in the field. The first question that came up was, "What is the most important piece of equipment that makes the biggest difference?" My response was simple - "Your kneecap." I went on to explain that the biggest mistake most people make when photographing dogs is to shoot standing up, creating a strong downward angle from the camera to the subject. In 2-dimensional space, a downward angle makes the subject appear less prominent as it occupies a weaker position within the frame. The next time you see one of those campaign ads about dogs and cats that are in need of rescue, take note of the camera angle. It will always be high, looking down at the animals to create a feeling of helplessness and dependence. This is done intentionally. Typically these are the qualities you want to avoid in photographing sporting breeds where strength, athleticism, power, and confidence are the elements we are seeking to portrait. Kneeling down and lining up the lens at eye level is the key to creating a strong, powerful presence for subjects like hunting dogs. 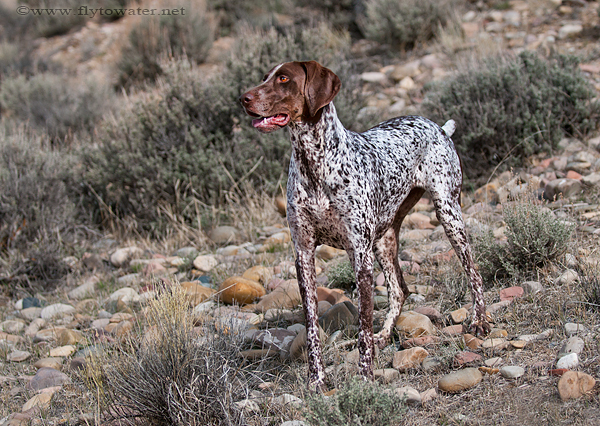 On Saturday while fishing in Wyoming I took a few shots of Brika (my favorite German Shorthaired Pointer that I don't own myself) to illustrate. Dropping to one knee poses a few problems out in the sticks where mud, cactus, rocks, and all manner of detritus usually make kneeling a real pain in the patella. Regardless, perspective is always paramount and foremost in my mind when looking to capture man's best friend. Getting low and shooting at eye level will give your pup a more commanding presence in the photo and create a stronger connection with the viewer. The photographer's willingness to mess up a nice pair of jeans and hork down ibuprofen for a few days after the shoot makes a bigger difference than any choice of gear. Awesome looking dogs....and great advice on how to get better photos of them! Thanks Sanders. 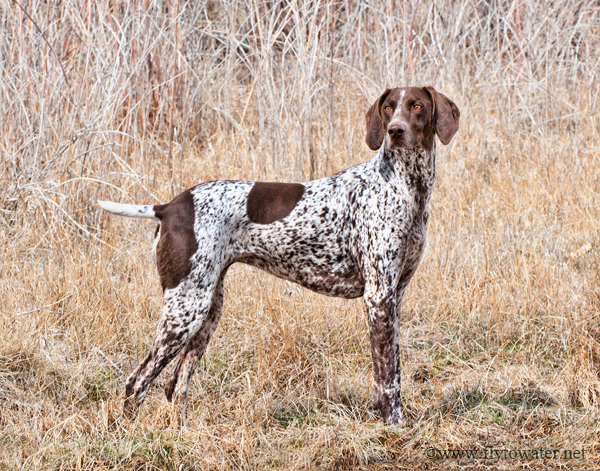 I have a great fondness for shorthairs. Several of this man's best friends have been GSPs. The GSP is a great dog. A really smart and sensitive animal.